-2- SKY HORSE/MOHAWK TRIAL The American Indian Movement (A.I.M.) continues to be the target of political attack and the target of long drawn out legal battles in this country. Paul Sky Horse and Richard Mohawk, members of A.I.M., face a murder charge in Los Angeles, California in a trial that is already three years old. The two activists are charged with allegedly killing an Inglewood, California cab driver, George Aird, at an American Indian Movement encampment on the Ventura-Los Angeles County Line. The case has seen many contradictory and unexplainable turns. According to the Native American publication [[underline]]Americans Before Columbus[[end underline]], the prosecution's three main witnesses were all present at the scene of the crime the night Aird was killed. The three, Marvin Redshirt, Marcie Eaglestaff, and Holly Broussard, are mysteriously linked to the case by the victim's possessions that were found on them as well as blood matching types of Aird's on their clothing. Their presence at the murder scene nor the tangible evidence has been explained. The latest development in the case was the denial of Judge Floyd Dodson to end the trial after the prosecution and defense had arrived at a plea bargain. Behind Dodson's decision to deny ending of the proceedings against Sky Horse and Mohawk may be defense attorney Leonard Weinglass' (Pentagon Papers trial) contention that because Dodson faces ousting from his job after the trial, following defeat of his bid for re-election, he could assuage an alleged financial crisis by prolonging the trial. The longer it continues, the more money Dodson earns. It is because of this that Weinglass has petitioned Dodson be disqualified from the case. Previous events casting serious doubt on the prosecution's stand were the misplacing of two knives believed to be the murder weapons, by the Ventura County sheriff, and the testimony by Marvin Redshirt that he lied numerous times on the stand. The state's other two witnesses also have serious questions surrounding their credibility to truthfully give evidence in the case. 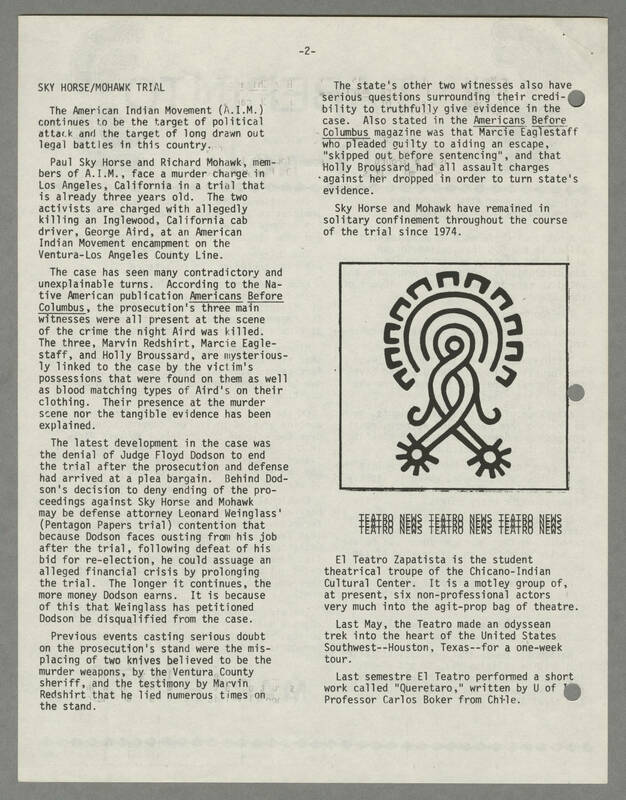 Also stated in the [[underline]]Americas Before Columbus[[end underline]] magazine was that Marcie Eaglestaff who pleaded guilty to aiding an escape, "skipped out before sentencing", and that Holly Broussard had all assault charges against her dropped in order to turn the state's evidence. Sky Horse and Mohawk have remained in solitary confinement throughout the course of the trial since 1974. TEATRO NEWS TEATRO NEWS TEATRO NEWS TEATRO NEWS TEATRO NEWS TEATRO NEWS TEATRO NEWS TEATRO NEWS TEATRO NEWS El Teatro Zapatista is the student theatrical troupe of the Chicano-Indian Cultural Center. It is a motley group of, at present, six non-professional actors very much into the agit-prop bag of theatre. Last May, the Teatro made an odyssean trek into the heart of the United States Southwest--Houston, Texas--for a one-week tour. Last semestre El Teatro performed a short work called "Queretaro," written by U of I Professor Carlos Boker from Chile.